Reawakening our Origins. A Pilgrimage Across Britain. where the good way lies; and walk in it, and find rest for your souls. During October, the Society of St. Columba will be undertaking our annual pilgrimage around England and Wales in the good company of Larry & Deborah Littlebird and their film-making son Jesse Raine. Larry is a Native American Pueblo elder from Laguna/Santo Domingo Pueblo. The Littlebird’s are the spiritual directors of Hamaatsa and White Dawn House, a Christ centred prayer sanctuary and spiritual retreat centre located on environmentally protected aboriginal lands, where life and experiences are rooted in an age-old indigenous wisdom and tribal orality. A truly indigenous expression of the Christian faith. 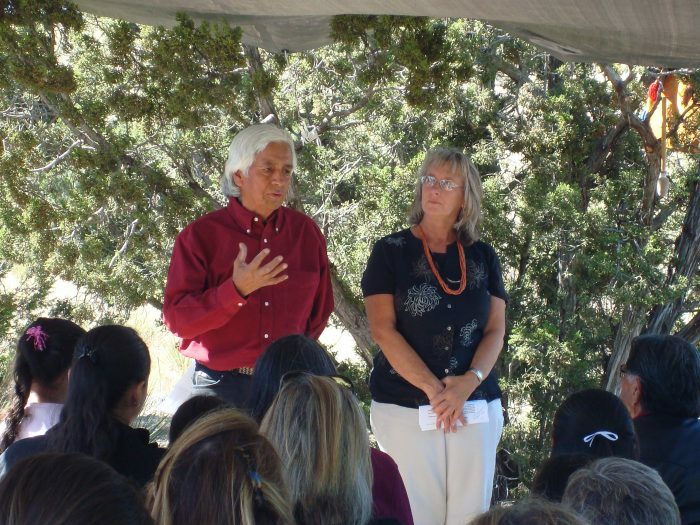 Larry and Deborah Littlebird are the Spiritual Directors at Hamaatsa, a Christ centred prayer retreat in New Mexico. We will follow the Holy Spirit across Britain and are conscious that our journey is in fact a continual prayer. A prayer that will leave a footprint on the land to which we belong. A prayer calling for the Kingdom of righteousness, peace and justice to visit us again. A pilgrimage that will see us changed in the quality of our walk with Jesus, where being formed in the image of Christ is the essence of our heart’s cry. St. Columba taught us to Be naked in the image of Christ and the evangelists. and to honour these words we recognise that change within ourselves must come first, before there can be any sustainable change in the nation around us. On our pilgrimage we will be visiting a number of communities across Britain and praying alongside our friends living in those locations (see below for venues). There is a call upon us to invest into the quality of our relationship with Christ, a quality that seeks an intimacy that transcends mere conceptual knowledge. We are seeking the encounter with Jesus that is rooted in the land and its communities. To be known by God requires time, and we do in fact have all the time in the world to dedicate ourselves to the pursuit of God and becoming a blessing to all those who are around us. On our journey we will be listening to the voices across the country and seeking to stand alongside and pray with the body of Christ. Praying for peace, reconciliation, mercy, and for an awakening of Gods love for all people and creation to take place. As we look up and look within we are confident that God will meet with us and call us forward into the reawakening that is taking place. For more information on dates, venues and times, please visit the Facebook links below. 10 October – One Church, Gloucester Place, Brighton. BN1 4AA. 13 October – 24 Nutcroft Road, Peckham, London. SE15 1AF. 20 October – St. Francis Church, 1 St. Francis Road, Langley. Hampshire. SO45 1XU. 21~22 October – Antioch Church, Copperworks Road, Llanelli. SA15 2NE. So please do come and join us, you will be most welcome and together we can join our voices in a concert of prayer that prays, your Kingdom come as we criss-cross our beautiful island. Herdwick Sheep at Columba’s Barn.